Thank you, thank you everybody! You have made Blue Jean Gourmet feel so welcome here in the wide, woolly blogging world. We appreciate your readership, your enthusiasm, and your recommendations. Please, keep it coming! 1) At the bottom of every post, a “Share/Save” button which enables you to pass posts along using virtually any internet service imaginable. 2) An email subscription service! Click on the sidebar link to subscribe to Blue Jean Gourmet updates–you’ll receive an email informing you of new posts. We won’t sell your email address or spam you, Scout’s honor. For those of you who would just rather bookmark BJG & check in with us periodically, we promise to keep to a regular Tuesday/Friday posting schedule, with the occasional tidbit thrown in on odd days. Okay, that’s all for logistics. Onto the food! I love breakfast. I LURVE it. Yummy yummy sweet and savory, syrupy, fruity, salty, crunchy, goodness all around. So please note that you will likely see a disproportionately high number of breakfast & brunch recipes around here– hope that won’t be a problem. Ha! Also, my photographer, Sonya, happens to be obsessed with French toast. She is quite the connoisseur, so I took it as high praise when she called this the best French toast she’d ever had. Score! There’s nothing particularly magical or secret about this recipe–I think the keys are, as always, quality ingredients and good technique. First, I always use challah for my French toast. 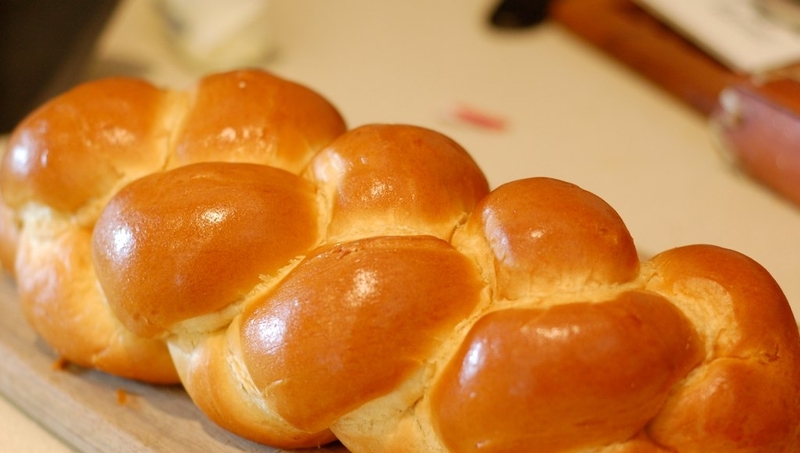 Challah, if you didn’t already know, is a Jewish egg bread, similar to brioche. Traditionally braided, this bread is eggy and airy and perfectly suited to French toast-ing. Since I started working at a Jewish school, challah has become part of my weekly life. We celebrate Kabbalat Shabbat, the beginning of the Sabbath, here at school on Fridays. The blessing over the challah and wine (or grape juice for school purposes), is the parent tradition of the Christian sacrament of Communion. Challah can easily be found in the bakery of your local grocery store, but if you know of a specialty baker in your area, give them a try. In addition to the traditional sliced & browned-in-butter (hungry yet?) recipe, I’m also including a more decadent baked version. It’s actually almost a bread pudding, so be aware that it’s not for the faint of heart!, but what I love best about it is that you can make the whole thing the night before & then pop it in the oven in the morning. Great for kids to help make, too, because they can whisk together the liquid ingredients and then smush bread cubes down into the gooey custard. 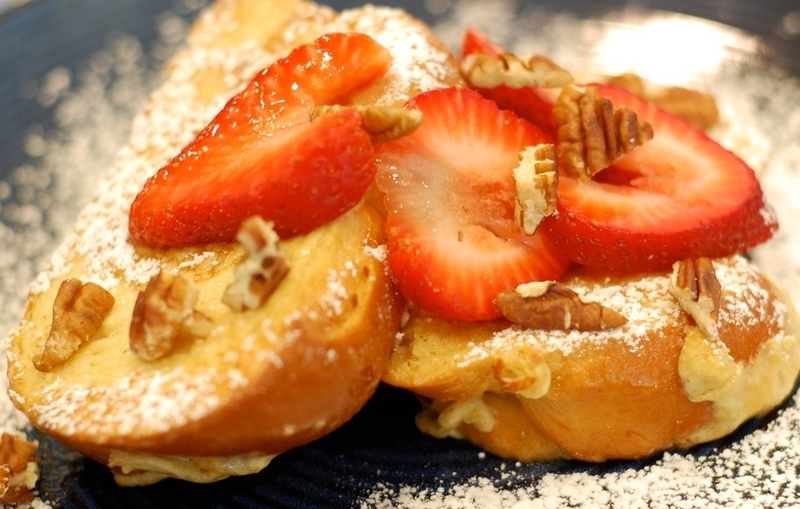 Serve either kind of French toast with fresh strawberries, which are SO GOOD right now. Other possible toppings include: blueberries, bananas, chopped, toasted pecans or almonds, maple syrup, powdered sugar. Serve with a side of bacon* and Mom will swoon. Who wouldn’t? Last but not least, a Mom-worthy beverage. Now not to get all snobby and fist-shaking, but this is not the drink of my people. It may be tasty, yes, but far from authentic. The real deal is strong, spicy, milky, and a little sweet. While it may require a trip to buy some items you don’t use regularly, I promise your purchases won’t go to waste as you’ll want to make this again & again. It’s a great way to “dress up” any breakfast or brunch and also works well as a dessert accompaniment. No matter what you cook or eat or are served this Mother’s Day, I hope it is full of love & joy. Thank goodness for mothers, especially mine. This one’s light & airy, the recipe below much denser & more intense. Dunk two slices at a time into their French toast “bath,” turning once. Allow them to sit only a minute on each side, before draining the excess liquid and moving them to the buttery pan. Cook approximately 2-3 minutes on each side, or until golden brown. Serve warm with accompaniments. I first encountered a recipe like this in a cooking class with Rebecca Rather, a Texas pastry chef. Since then, I’ve seen lots of recipes like it, but this is my version. optional: I like to add in 1 tsp. of almond extract or 1 tsp. of Amaretto. You could also throw in 1 tsp. of orange liquor (Grand Marnier, Triple Sec, Cointreau) if you have some around. Remember, decadent is the theme here! Grease the baking dish, then arrange the challah cubes on the bottom. Whisk together liquid ingredients, then pour over bread. Use your fingers (very fun for kids!) or the back of a spoon to ensure that all of the cubes are soaked thoroughly. At this point, cover the whole thing and stick in the refrigerator for at least an hour or up to overnight. When you’re ready to bake, heat the oven to 425. Bake for approximately 35-45 minutes, or until golden brown. If you’re interested, you can create a crème Brule effect with your baked French toast—when it’s done baking, sprinkle a few tablespoons of sugar on top (you can include cinnamon if you like) and turn your oven to “BROIL.” Watch closely for the sugar to bubble and caramelize, but make sure you rescue your toast before burning takes place! Cut into squares and serve with accompaniments. You’d be surprised, you can probably find all of the stuff you need for this recipe at your local grocery store—all these spices can be found with the baking things, and if they have an “International Foods” aisle, you can get authentic loose-leaf tea there. Should you be up for a trip to the Indian grocer, I recommend it—spices will be much cheaper. Bring the water to a boil, adding the tea & spices. Allow to boil vigorously for about 4 minutes before turning the heat down and adding milk and sugar. Stir gently and allow the milk mixture to heat up before straining into a teapot or individual cups. *TIDBIT: I started cooking my bacon in the oven, under the broiler, and it has changed my life for the better. Lay the bacon strips (mmm, bacon) out on a broiler pan—no need to pre-grease! Slide the whole thing into the oven and turn your broiler on “low.” Depending on oven strength, it will take about 8-10 minutes, but watch closely so you don’t burn your bacon. What I love about this option is that it’s no-fuss and all the grease drips down into the bottom pan so you can dispose of it or save it in a jar in the refrigerator like I do (because pork fat just makes things better). I love both of these recipes for french toast, even though I didn’t really grow up eating it and have had french toast several times when I didn’t like it. Both these are really, really good and super easy. And the chai is fabulous, especially in those little tiny cups that are so cute! can’t wait to try your recipe!! Pork fat does make everything better. And, though I’m slightly ashamed to admit it, I used to be a “this” drinker, but now that I’ve had your chai, there is no going back to the syrupy, overpriced variety. Melissa & Courtney–I don’t want to slam Tazo, because I do use their teabags on weekday mornings when I’m in a rush…but it’s truly apples & oranges comparing one to the other. ooh, and the mention of authentic hot chocolate got me craving some even though it’s 90 degrees outside! ooh i hear you – i have mass tazo love!! but even tonight, when i had the wonderful opportunity to have some authentic chai, i was reminded of just how incredibly different they are! Not to mention that it was also only a buck a cup and we usually pay about $4 at the local Indian restaurant. It was good, even with the high humidity! Wanted to give you a huge kudos….I made the chai last night and am in love. I’m very picky about my chai and this was fantastic!!! I really like it iced in the summer, so perfect timing on your recipe. Going to try the french toast this weekend, thanks so much!! Dana, you are so very welcome. Thanks for taking the time to offer kudos–I’m so glad to know you’ve fallen in love with the chai!